Bridgeton City Hall is located at 181 East Commerce Street, Bridgeton NJ 08302; phone: 856-455-3230. Photo: General James Giles House, ca. 1701, 143 W. Broad St., Bridgeton, New Jersey. Listed on the National Register of Historic Places in 1978. Photographed by User:Smallbones (own work), 2010, [cc-by-1.0 (creativecommons.org/publicdomain/zero/1.0/deed.en)], via Wikimedia Commons, accessed April, 2013. In 1754, Daniel Elmer, who was a surveyor, and the oldest son of Rev. Daniel Elmer, pastor of the Fairfield Presbyterian Church, laid out for Alexander Moore a town on the east side of the Cohansey River, which it was proposed to call Cumberland. The streets were laid out at right angles, and the squares contained each 18-1/2 square perches. It extended from what is now Jefferson Street to a little north of the present iron works on the north, and from the river to about as far east as where Orange Street now is. Some of the old title-deeds refer to this plan, but the streets were never opened. Most of the site was then the original forest. The road to Deerfield was laid out in 1768, upon the old travelled track from the bridge to near the corner of the present Commerce and Pearl Streets, thence northerly, a little south of where Pearl Street now is. 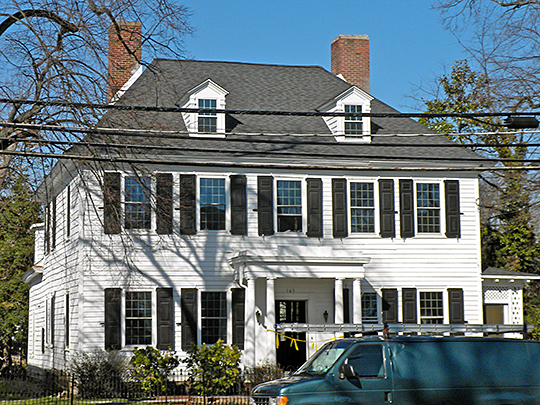 In 1785, the road to Fairfield was changed, and laid out to begin at John Westcott's stone house—then a low one-story stone house—standing at the southeast corner of the present Commerce and Pearl Streets, afterwards for years owned and occupied by Mark Riley, the lot extending up to where Orange Street now is; thence southward along the present Pearl Street, over the dam made by Col. Enos Seeley, and thence along what is now the left hand road to the brick-kiln corner, and thence south along the old road over Rocap's Run. John Moore White having been licensed to practice law, and married, came to Bridgeton in 1791 and erected a handsome dwelling, now forming a part of the hotel at the corner of Commerce and Laurel Streets. He procured the road to be changed and to run as it does now, called Laurel Street. He laid out himself and fenced some of the other streets to correspond. His lot, inclosed with a handsome fence, and well improved with shade and fruit trees, and an extensive, well laid out garden, extended on Commerce Street from the corner of Laurel to the present Water Street, and on Laurel Street from the corner to James Hood's line. Elmer, Lucius Q. C., History of the Early Settlement and Progress of Cumberland County, New Jersey, George Nixon, Publisher, Bridgeton, 1869.